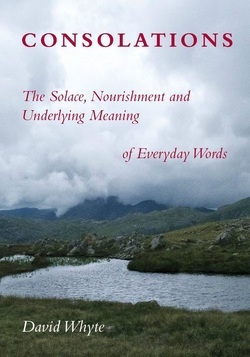 This constant dialogue between reality and illusion, moderated by our use of language, is what poet and philosopher David Whyte explores in Consolations: The Solace, Nourishment and Underlying Meaning of Everyday Words (public library) — a most remarkable book “dedicated to WORDS and their beautiful hidden and beckoning uncertainty.” Whyte — who has previously enveloped in his wisdom such intricacies of existence as what happens when love leaves and how to break the tyranny of work-life balance — constructs an alternative dictionary inviting us to befriend words in their most dimensional sense by reawakening to the deeper and often counterintuitive meanings beneath semantic superficialities and grab-bag terms like , beauty, and solace. And he does it all with a sensibility of style and spirit partway between Aristotle and Anne Lamott, Montaigne and Mary Oliver. is a mirror to presence and a testament to forgiveness. Friendship not only helps us see ourselves through another’s eyes, but can be sustained over the years only with someone who has repeatedly forgiven us for our trespasses as we must find it in ourselves to forgive them in turn. A friend knows our difficulties and shadows and remains in sight, a companion to our vulnerabilities more than our triumphs, when we are under the strange illusion we do not need them. An undercurrent of real friendship is a blessing exactly because its elemental form is rediscovered again and again through understanding and mercy. All friendships of any length are based on a continued, mutual forgiveness. Without tolerance and mercy all friendships die. love is the love human beings experience most of the time. The very need to be fully requited may be to turn from the possibilities of love itself. Men and women have always had difficulty with the way a love returned hardly ever resembles a love given, but unrequited love may be the form that love mostly takes; for what affection is ever returned over time in the same measure or quality with which it is given? … And whom could we know so well and so intimately through all the twists and turns of a given life that we could show them exactly, the continuous and appropriate form of affection they need?